The Akkadians had conquered much of the Ancient Near East under the leadership of Sargon the Great ca 2300 BCE. The empire continued to dominate Mesopotamia and the surrounding lands for four generations. 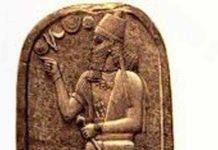 Sargon’s grandson, Naram-Sin, was as an effective ruler as Sargon himself and during his nearly four decades of rule he stabilized Akkad’s domain. However upon Naram-Sin’s death, the new king was hard-pressed to hold the empire together. Naram-Sin’s successor, Shar-Kali-Sharri (2217-2193 BCE), whose name means King of Kings, was immediately beset by treachery and rebellion. Although some accounts portray the new king as holding the empire’s widespread enemies at bay it is clear that the once mighty empire was reduced to the territory surrounding its capital city Akkad. The city of Akkad had built itself on wealth gained from the imperial monopoly on trade. Once the king lost control over the region’s various trade routes the city of Akkad itself was doomed. Within the period of just a few generations the city itself vanished from history. Some accounts indicate Akkad was ultimately destroyed by invading hordes of Gutians from the region of the northern Zagros Mountains. According to the Sumerian King List a new Dynasty from Uruk emerged and defeated the Akkadians. This dynasty was, however, quickly followed by a Dynasty of Gutians. For nearly ten years there was no determinate king of the Gutians although their army dominated Sumer and Akkad. During this period of anarchy a few more kings of Akkad are attested and then after the reign of Shu-Turul, around 2154 BCE the Akkadian Dynasty and its once marvelous city of Akkad are no more. According to one text written some centuries later the city was cursed because Sargon had moved earth from the city of Babylon to lay the foundation at Akkad. This version of events must be dismissed as mere storytelling as the city of Babylon was only a village at the time of Akkad’s founding. Another text, The Cursing of Akkad, explains that it was in fact Naram-Sin who was responsible for invoking the wrath of the gods. The text relates that for a period of time the goddess Inanna took up residence in the city of Akkad. She had no time to rest as she supervised the luxurious provisioning of the city. All of its citizens were blessed and all of its warehouses were overflowing with tribute from foreign lands. Yet, with all of this wealth diverted to Akkad the city states of Sumer were suffering. In particular, the temple establishment of the chief god Enlil in Nippur known as the, E-kur, denounced Akkad’s rule. What was likely a political rebellion supported by Nippur is portrayed in the ancient texts instead as all of the gods withdrawing their blessings from Akkad. Even Innana who had taken up residence there left the city. The city began to suffer immediately as its trade revenues dried up. Then the king, Naram-Sin, had a dream that led him to believe that his city’s days were numbered. He tried to divine the future by reading omens and he came to believe that the gods had indeed turned against his city. According to the legend the king took on an austerity plan: he abandoned his robes of state, his royal chariot, and his royal ship for seven years in an attempt to alter the fate of Akkad. However, after his attempts at appeasing the gods the omens offered no comfort so he gave up on a religious solution and resorted to extreme measures. Naram-Sin sent his army to the E-kur temple where they systematically demolished and looted the sacred building. The wealth of the E-kur was carried back to Akkad and along with it the curse of Enlil. Enlil inspired the Gutians, described as intelligent but with “canine instincts and monkey features,” to invade. Not only did the Gutians attack Akkad but the region was thrown into such lawlessness that people were unable to cultivate the fields. The legend of the Cursing of Akkad places the invasion of the Gutians as having occurred during the reign of Naram-Sin which is likely not accurate. However the underlying theme of the curse reflects the later belief that King Naram-Sin was responsible for offending the gods and thereby dooming his city. After some decades the other cities of Sumer recovered, but not the city of Akkad. Some years later the Third Dynasty of Ur rose to dominate the lands known as Sumer and Akkad, yet the city, which had given name to the region of central Iraq was no more.